The B & B Cave Canem, the historic center of Pompeii, is located 100 meters from the main entrance of the excavations of Pompeii, 100 mt from the Sanctuary of Our Lady of Pompei, 300 meters from the railway station of the State , 250 meters from Circumvesiana train station, stop at Pompeii Sanctuary. Located at the heart of the city is well connected to all major tourist areas of Naples, Herculaneum, Vesuvius, Sorrento, the Amalfi Coast through the network of public transport (trains, buses) that allow tourists to easily reach all the destinations. The complex is warm and comfortable, all rooms are equipped with kitchenette and bathroom. The owners are hospitable and always attentive to the needs of their guests, will offer tips for all cultural events of Pompeii, cafes and shops. Check in is from 14. 00 to 19. 00 unless special arrangements by phone. You are kindly requested to inform three hours prior to arrival. THE BALANCE MUST BE MADE AT THE TIME OF CHECK IN. KEYS WILL REMAIN IN YOUR POSSESSION TO CHECK OUT. The room must be vacated by 10. 00 on the day of your departure, unless special arrangements. 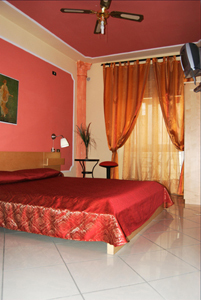 The hotel is comfortable and cozy, all rooms are equipped with kitchenette and bathroom.